Photo by @topgold snapped with Nokia Lumia. I TEACH ADULTS who rarely read the supplemental material I give them. They also don't carve out the time for reading in any form, on screen or on paper. I think that's a problem because I have experienced the joy of reading. I've watched our six year old daughter graduate into senior infants with the ability to sound out (and often guess) words on a page. At first it was hard. Now it's like eating. We spoon-fed her for a while but now she wants the whole banana by herself. 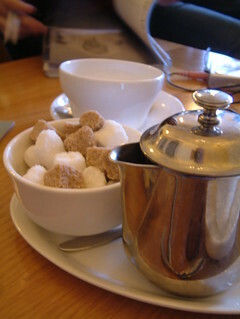 Photo by @topgold of Coffee Service in The Clarence. I GET MY BEST results over coffee or in a quiet corner of a pub with a Moleskine and a pint. I define my “third place” in those contexts. Even in recessionary times, we need affordable luxury where creatives can share and enjoy a cuppa and conversation. This is a known social funciton. Sociologists I follow chat about the need for waterinng holes in large cities, beyond home and office. It's what makes Shoreditch the creative oasis that it aspires to become. MORE THAN 100 MILES of my weekly work routine cut through farmers' fields flooded by February storms. Downed trees, knee-high water, potholes and mud mark the way from campus to campus. This is my first experience living with the after effects of night-long sustained gales. The violent winds ripped off branches of mature trees, launched back yard trampolines into orbit, ripped roofs off sheds, moved garden furniture from their mounts and distressed local cattle. We lost a garden umbrella and cleaned up a wheelie bin that blew over. Ten days after the last major precipitation, several local roads have well-marked flood warnings and two have temporary traffic signals that stop traffic for 30 seconds on each side. My travel from classroom to classroom often extends 52 miles in each direction. There is no public transportation link that serves the timetable I keep on twice-weekly runs down country lanes between two counties in rural Ireland. And there is no overtaking lane when coming up behind tractors pulling slurry tanks. Beyond my lifetime, I doubt the local rural routes will get wider, straighter or faster. So I tell my kids to expect more of the same when they start driving the Tipperary highway system in 10 years. I SHARE MY personal wifi hotspot at industry events. I keep it "open" and listen for people to exclaim, "I've found Topgold!" I think it's important to share 3G data connectivity, especially in venue where the house wifi creaks and groan from too many video streaming sessions. Weeks later, friends have shown me their phone screens where my Twitter name sits as an SSID that they graciously used. It's always a conversation starter and I have to think it's also a method of branding. WHILE DRIVING from the outskirts of Limerick, I watched a Traffic Announcement fill the screen of our 2010 Nissan Qashqai. It was the first time I saw that live traffic advisory in Ireland. Limerick's Live95 provides the TA service and its information covers counties Limerick, Clare, Galway, and Tipperary--although it may extend farther than the announcements I have heard for these areas. I miss the Stau reports that I heard on German radio when I lived there. They would beam onto the car's audio at five and 35 minutes past the hour with immediate transmissions of exceptionally hazardous situations. Those just-in-time advisories saved me from head-on collisions late at night on German roads. I haven't heard the same kind of suicidal driving relayed by AA Roadwatch in Ireland and wonder if the Irish TA service would interrupt regular programming with a loud booming voice if the same kind of threat was reported on an Irish road. Screenshot from @topgold's Lumia using 4th & Mayor. THE FOURSQUARE DATABASE has evolved into a handheld concierge for me while wandering Ireland. It consistently offers tips for outdoors activities. As a long time user, I have kept updating the 4Sq app on iOS, Android and Windows Phone. Each iteration of the app is snappier than the software it replaces and with every month that passes, Foursquare's contextual data becomes more intelligent. This means its lexicon seems to know synonyms for search terms I use. And in a delightful and perhaps unnerving twist, Foursquare seems to prioritise places nearby based on similar venues I previously designated as pleasant. In my case, I enjoy high quality suggestions for pasta and croissants. Although I know I am gaming the system, I often use Foursquare to check into places similar to ones located in cities on my travel itinerary. Now when I open the app in new parts of Limerick, Dublin or Galway, my 4Sq handset often suggests perfect plates of pasta surrounded by robust high powered WiFi. Screenshot from Lumia 925 by @topgold. WE HAD SEVERAL days of power outages this winter so my Nokia Lumia had primary opportunities to prove it could go two days between rechargings. I cherish the resilience of my Nokia 925 on nights when its iPhone and Android brothers could perform as long as the intelligent power-saving from Nokia. The large screen on my Xperia Z draws too much power and its notifications don't seem to totally squelch since some apps do not listen to the universal settings. Our iPhone needs to have its wifi connectivity switched off if we expect it to function as an alarm clock the next morning. Battery saving easily toggles on and off with my Nokia Lumia. I can easily extend the Lumia 925's duty day by four hours merely by switching off push email service. And using the "Battery Saver" in "Settings" turns off a myriad of services while in standby, resulting in another two hours of extended phone duty day for me. I TALK TO my phone at least once a day now, trying to find things faster. And I show creative multimedia students what I'm doing because I'm convinced you need to be discoverable by people who try to describe you in 10-second chunks of speech. I use a Microsoft Windows Phone as my main device. It understands me and my American accent better than my Scottish friends with their Apple iPhones. I talk to Google search as often as I tap in a search query on screen. And I use our Nissan's voice services several times a week when sending or receiving text messages while underway. 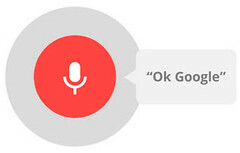 Voice is a future-proof user interface. I'll root my Android phone so it might start to understand the command “Ok Google” when I say it. Android KitKat on the Nexus 5 is always listening for those command words. I grew up with a starship computer that understood the captain's voice. Today, I listen to command voices on social networks (i.e., Phil Sorell and Paul Hopkins) as they bring me content in the form of audio logs. They sound like they know what they're talking about and I wonder if they've wrapped themselves in an ecosystem where voice recognition and natural language processing will serve their needs in this decade. Photo of Sick Firebird by @topgold using Lumia. I'M INDEBTED TO James Macolgan, a capable Scottish electrician, for offering tips via social media to problems arising from my broken central heating. In a perfect world, he would live closer and help me finish the job. Mac is one of 80 different voices I've heard during February 2014 while using the Audioboo app on iOS and Android. I also pull my "followed" subscriptions directly into my Lumia handset by using the mobile version of Internet Explorer. This year, those voices reflect a mature community, one that has evolved partly because it's been ignored by the parent website. It's hard to predict whether today's shiny online community will last beyond a few years. I've moved from forums hosted on bulletin boards, to mailing lists, to the app-friendly newsfeeds many of my friends use today. But in every instance, there are a handful of people whose contributions, sacrifices and willingness to pay forward their skills will always guarantee them a pint in any venue where I'm seated. So James Macolgan, if you're reading this, know that I use Foursquare whenever I'm seated within a shout of a bartender. I'm good for my shout. ONE OF THE JOYS of living without electrical power in 21st century Ireland is watching how our senses attempt to normalise life. This morning several noses thought our toaster had returned from the dead because the aroma of fresh roasted was in the air--the smell came from a candle that had lighted the nuts at its base. Fifty hours without power have decimated our supply of candles, even though we were not using candlepower to read at night. I discovered I need two candlepower to shave and each bedroom needs the same candle battery in place to create a friendly dancing shadow effect on the walls. Like my family three generations ago, we have adopted a common room routine, moving everything we do together into the kitchen. We immediately see the need to get a time-tested solid fuel Aga Stove now that 21st century winter weather patterns have imposed their will on Ireland.